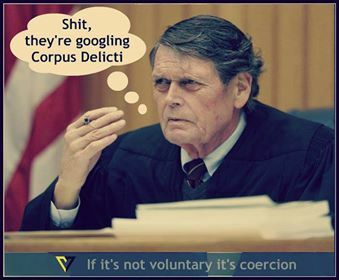 Supreme courts ruled “Without Corpus delicti there can be no crime”“In every prosecution for crime it is necessary to establish the “corpus delecti”, i.e., the body or elements of the crime.” People v. Lopez, 62 Ca.Rptr. 47, 254 C.A.2d 185. “In every criminal trial, the prosecution must prove the corpus delecti, or the body of the crime itself-i.e., the fact of injury, loss or harm, and the existence of a criminal agency as its cause. ” People v. Sapp, 73 P.3d 433, 467 (Cal. 2003) [quoting People v. Alvarez, (2002) 27 Cal.4th 1161, 1168-1169, 119 Cal.Rptr.2d 903, 46 P.3d 372.]. “As a general principal, standing to invoke the judicial process requires an actual justiciable controversy as to which the complainant has a real interest in the ultimate adjudication because he or she has either suffered or is about to suffer an injury. ” People v. Superior Court, 126 Cal.Rptr.2d 793. “Without standing, there is no actual or justiciable controversy, and courts will not entertain such cases. (3 Witlen, Cal. Procedure (3rd ed. 1985) Actions § 44, pp 70-72.) “Typically, … the standing inquiry requires careful judicial examination of a complaint’s allegations to ascertain whether the particular plaintiff is entitled to an adjudication of the particular claims asserted. ” (Allen v. Wright, (1984) 468 U.S. 737, 752…Whether one has standing in a particular case generally revolved around the question whether that person has rights that may suffer some injury, actual or threatened. ” Clifford S. v. Superior Court, 45 Cal.Rptr.2d 333, 335. There are seven elements of jurisdiction and every element MUST be met in order for the court to proceed. 2. The statute of offense must be identified by its proper or common name. A number is insufficient. Today, a citizen may stand in jeopardy of criminal sanctions for alleged violation of statutes, regulations, or even low-level bureaucratic orders (example: colorado National Monument Superintendent’s Orders regarding an unleashed dog or a dog defecating on a trail). If a number were to be deemed sufficient, government could bring new and different charges at any time by alleging clerical error. For any act to be triable as an offense, it must be declared to be a crime. Charges must negate any exception forming part of the statutory definition of an offense, by affirmative non-applicability. In other words, any charge must affirmatively negate any exception found in the law. 3. The acts of alleged offense must be described in non-prejudicial language and detail so as to enable a person of average intelligence to understand nature of charge (to enable preparation of defense); the actual act or acts constituting the offense complained of. The charge must not be described by parroting the statute; not by the language of same. The naming of the acts of the offense describes a specific offense whereas the verbiage of a statute describes only a general class of offense. Facts must be stated. Conclusions cannot be considered in the determination of probable cause. 4. The accuser must be named. He/she may be an officer or a third party, but some positively identifiable person (human being) must accuse; some certain person must take responsibility for the making of the accusation, not an agency or an institution. This is the only valid means by which a citizen may begin to face his accuser. Also, the injured party (corpus delicti) must make the accusation. Hearsay evidence may not be provided. Anyone else testifying that they heard that another party was injured does not qualify as direct evidence. 5. The accusation must be made under penalty of perjury. If perjury cannot reach the accuser, there is no accusation. Otherwise, anyone may accuse another falsely without risk. 6. To comply with the five elements above, that is for the accusation to be valid, the accused must be accorded due process. Accuser must have complied with law, procedure and form in bringing the charge. This includes court-determined probable cause, summons and notice procedure. If lawful process may be abrogated in placing a citizen in jeopardy, then any means may be utilized to deprive a man of his freedom, and all dissent may be stifled by utilization of defective process. “The essential elements of due process are notice and an opportunity to defend. “Simon v. Craft, 182 US 427. 7. The court must be one of competent jurisdiction. To have valid process, the tribunal must be a creature of its constitution, in accord with the law of its creation, i.e., Article III judge. Lacking any of the seven elements or portions thereof, (unless waived, intentionally or unintentionally) all designed to ensure against further prosecution (double jeopardy); it is the defendant’s duty to inform the court of facts alleged for determination of sufficiency to support conviction, should one be obtained. Otherwise, there is no lawful notice, and charge must be dismissed for failure to state an offense. Without lawful notice, there is no personal jurisdiction and all proceedings prior to filing of a proper trial document in compliance with the seven elements is void. A lawful act is always legal but many legal acts by government are often unlawful. Most bureaucrats lack elementary knowledge and incentive to comply with the mandates of constitutional due process. They will make mistakes. Numbers beyond count have been convicted without benefit of governmental adherence to these seven elements. Today, informations are being filed and prosecuted by “accepted practice” rather than due process of law.